← The impact of difference PART 2: The silent influence of Cultural Capital. It is good that you have spoken about areas other than racism and oppression. When formulations/ psychs have been more open to discussions about race the focus tends to be on oppression and experiences of racism. Yes this is important and can often be central to a person’s narratives and experiences. However, something that often gets neglected and rarely discussed is internalised racism- so I’m glad that you have given it the attention it really needs. This is just my opinion but I think internalised racism at times can be more damaging than oppression. With oppression you often have people to share experiences with and in history this has led to shared power to fight against the oppressor- e.g the civil rights movement. However with internalised racism you’re on your own- which as you correctly state is damaging for self esteem. So yes more attention needs to be paid to this. Your question about which community the SU affiliates with taps into a question I’ve yet to explore but always wondered about. I know there are studies looking at assimilation etc. but I’ve often heard a narrative of people going back to their home country and trying hard to dress, walk and talk like the locals but much to their frustration still being regarded as a ‘tourist’ yet experiencing oppression in the country they reside in. How does this resonate with them? Who do they identify with- do they develop multiple identities- does this create an internal conflict. A really trivial example- but my husband is Nigerian- when Nigeria are playing against England in football I always ask him who he’s going to support- and he often has to think about it! Just a couple more points- I think it’s important to keep it idiosyncratic and to use the terms the SU uses. Perhaps they don’t think of themselves as oppressed- but would use a different term to describe their experiences. That’s why I think it is important for you to ask them for their views on what is oppression etc. Finally- this may be over complicating it, but I wonder about incorporating a feature of the power map? Perhaps you could discuss with the SU which of the different aspects on the formulation resonates more with them- which impacts the most? Which do they feel they have most control over? Etc. Hi Dee and thanks for your detailed feedback. I agree with you that internalised racism (or internalised oppression generally) can be more damaging than social oppression, I think it is the main mediator through which people get psychologically harmed by social oppression. My hope is that mental health professionals will become better able to recognize it and support service users through it. The point you raised about affiliation is a key one for 2nd and 3rd generations of immigrants. It reminds me of a beautiful expression we have in French ‘le cul entre deux chaises’ which literally means sitting on two chairs with your bum in the middle. I think figuratively it illustrates how uncomfortable things can be culturally for racialized groups. Research strongly indicates that, in most circumstances, having an ‘integrated’ identity (which embraces both the culture of the ‘host’ country and that which is of descent) is correlated with more positive health, mental health and social outcomes. 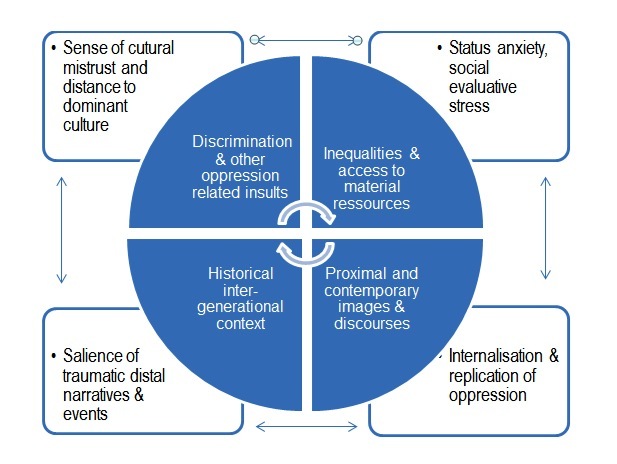 Those are solid empirical findings which have been replicated internationally and cross-culturally over the past few decades but of course, for the bi-cultural individual, it can take a lot of effort and, navigating different expectations and norms (especially if one feels he/she fits nowhere and/or does not feel fully accepted in either cultural group) is emotionally demanding. Our clinical interventions need to take account of those experiences and not relegate them to the domain of the taboo, of the irrelevant or the ‘specialist’. I really do like the point about indiosyncrasy, there is absolutely no value in enforcing a framework on someone who does not see it as useful. Indeed this would amount to replicating oppression in the therapy room. Some S.U. may simply not find the model useful, some may find it too exposing especially if the therapist using it has not done some serious reflecting re: racial bias or privilege… I am hoping to consult more widely before finalising the tool. Hopefully getting service users’views will help. Thanks very much for commenting.